To register in the 30° Trofeo Andrea Margutti is necessary to FILL OUT AN ONLINE FORM, available on our website www.trofeomargutti.com starting from the date of the registrations opening. ENTRY FEE PAYMENT CONDITIONS: ONLINE WITH CREDIT CARD. Any different conditions of payment will not be accepted. The entry fee includes the entry cost , tax and the track rent for free practices, Friday 5 April. The race number will be assigned by the Organizer. IMPORTANT: The ONLINE registration DOES NOT confirm the participation in the competition. At the end of the online registration, all drivers will receive an e-mail with the confirmation that the registration has been done. This e-mail does not confirm the participation in the race. 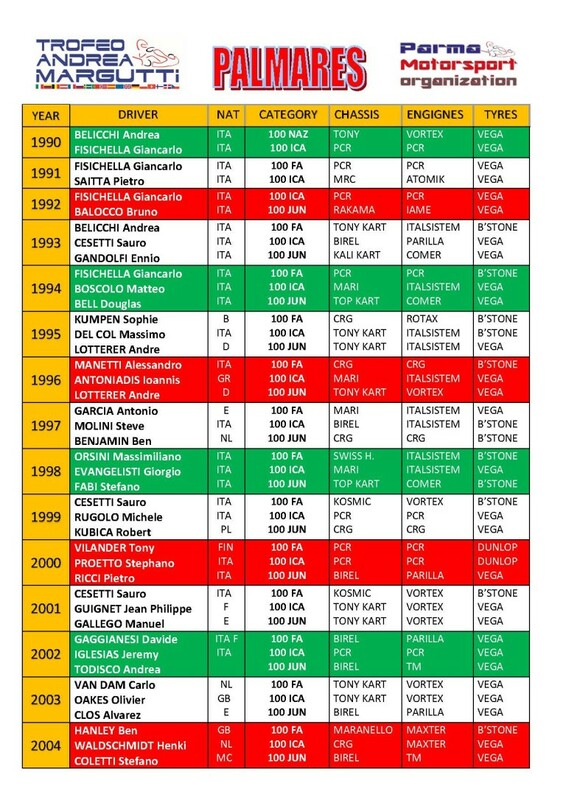 Drivers admitted to the sporting checks before the race will be announced in time on the official www.trofeomargutti.com website. The Promoter will have the right to reserve or to reject any registrations and/or entries at any time in his sole and final judgment, without the obligation to give any reasons. The effective participation in the competition will be definitely confirmed only with the completion of the sporting checks according to the documents submitted in original and it will be final with the exposure of the list of checked drivers in the race board.